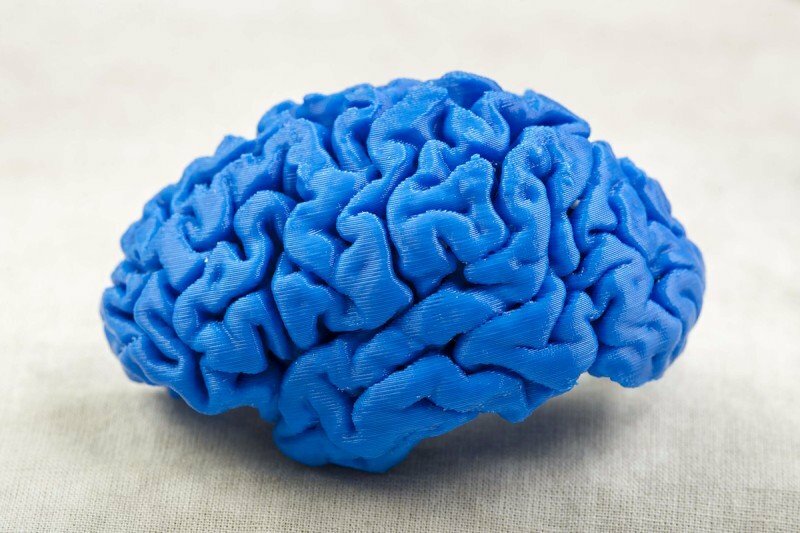 A model of a brain created by a 3-D printer. Memorial Sloan Kettering biomedical engineers are applying three-dimensional printing technology to benefit patients in a number of ways. 3-D printers can create new surgical tools. They can also be used to develop models of patients’ tumors. They may eventually find use in the creation of medical implants. It looks like a large microwave or a potter’s kiln, sitting on a countertop in Memorial Sloan Kettering’s basement machine shop. But it has far more important uses. Peek inside this box, which is actually a three-dimensional printer, and you might see a model of a new surgical tool coming together before your eyes, the creation of customized brackets to hold medical equipment, or the construction of a brace to support a patient whose neck has been weakened by cancer treatment. 3­-D modeling allows surgeons to “feel” tumors in their hands. Watch a time-lapse video that shows a model of a brain being printed. MSK uses a type of 3­-D printing called fused deposition modeling, which works like this: Plastic, in the form of thin strings wrapped around large spools, is fed into the printer and liquefied. Digital data from a computer program — such as 3­-D design software, a CT image, or an MRI image — are converted to a standardized file format and uploaded to the printer’s software, which directs the printer to build a 3­-D plastic model. The production time depends on the model being created, but generally the printer takes several hours to generate a finished product. Surgeons are particularly interested in the use of 3­-D printing to refine the design of the tools they use. A surgeon can hold a plastic model of a new implement created by the 3­-D printer in his or her hand and provide feedback on what may still need to be changed, with the goal of retooling it until it is just right. Biomedical engineers are also working to use 3-D printing to make molds to position patients during radiotherapy treatments that are more comfortable than the devices that are currently used. Mechanical instrumentation supervisor Peter Piechocniski notes that 3­-D printing could eventually be applied to create custom implants for patients who lose a part of the body to cancer. “We could use data from digital scans, like a CT scan, to recreate a segment of bone, for example, that needed to be removed due to cancer,” he explains. The customized implant design would then be sent to an outside vendor to produce using materials that are biocompatible, meaning they can be safely implanted inside a human body. The 3­-D printing revolution gives us the ability to shape materials specifically for each patient. MSK’s team of medical illustrators — led by Sue Weil-Kazzaz, manager of media services, medical graphics, and photography — are also collaborating with engineers to create models for presurgical planning. While CT and MRI scans provide valuable information about anatomy, it can still be difficult to visualize the intricacies of the inside of an organ or the surgical field. By holding a 3­-D model of an organ containing a particularly complex tumor, for example, the surgeon can rotate it and even cut into it, gaining a greater sense of what to expect when he or she starts the operation.